The thing that blindsided me were the small things they had no idea how to do, like mailing a letter. I remember the staff meeting where our program director described to us (with our jaws dropped) an eighteen- or nineteen-year-old girl who had no idea where to write the outgoing or return address on an envelope. No one had ever taught her how to do it. No one was ever around or cared enough to show her the simple and important act of mailing a letter. It’s been several years since I worked at Casa Valentina, but I think about the girls often as I go about the business of raising my boys. I am, quite literally, the opposite of the mother figures most of the girls at Casa Valentina knew. My children are the center of my world. I cater to their every whim. I often joke (but it’s true) that I serve at the pleasure of my adorable and demanding children. One might even describe my parenting behavior as helicopter-ish. I live for my kids. I do everything for my kids – so much so that if I’m not careful, I’ll end up with two grown boys who lack simple – and important – life skills. Like knowing how to mail a letter. A few days ago, Dylan made a picture for his cousins who live in San Francisco. When he was done, I asked him if he wanted to mail it to them. Of course, he did. I could have easily sealed, addressed, stamped, and mailed the letter the next day while he was at camp, but I thought about Casa Valentina and did the opposite. I let Dylan fold the picture and slide it inside an envelope. I showed him where to write his and his cousins’ address (I helped with the writing), and then he sealed the envelope and he put the stamp in the top right corner. 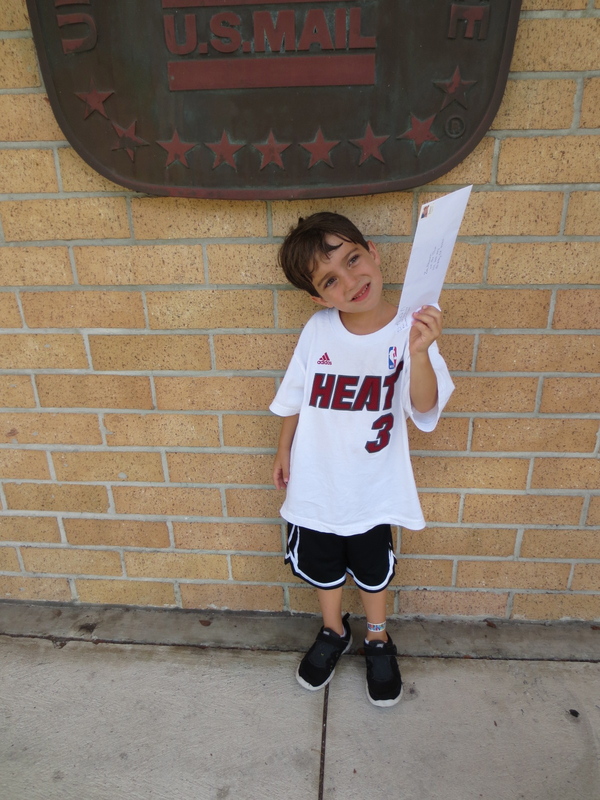 Yesterday after camp, we went to the post office together to mail the letter. After he dropped the envelope in the slot, I said, “Congratulations Dylan! You mailed your first letter!” which prompted a few people standing nearby to snicker. (I like to think they thought it was a cute rite-of-passage rather than an exercise in silliness by an overly enthusiastic Mama.) The whole thing was a bit corny, but you should’ve seen the smile on Dylan’s face (and mine) as he mailed his very first letter. The point I’m trying to make here, besides providing some damning evidence that I’m a Wonky Mama, is that even though we want to do everything for our kids, we can’t. It’s often easier and less messy, like putting straws in their juice boxes so the juice doesn’t squirt everywhere or putting toothpaste on their toothbrushes so the sink doesn’t end covered in the sticky stuff, but if we always do these things for them, they’ll never learn how to do it for themselves. The next time you write a thank you note, mail a letter, fill out a bank deposit slip, or write a check, involve your kids in the process. Someday they’ll thank you. Oh, and don’t forget to teach them to say please and thank you or else they won’t know how to do that either. And there’s nothing more annoying that a grown-up with no manners. 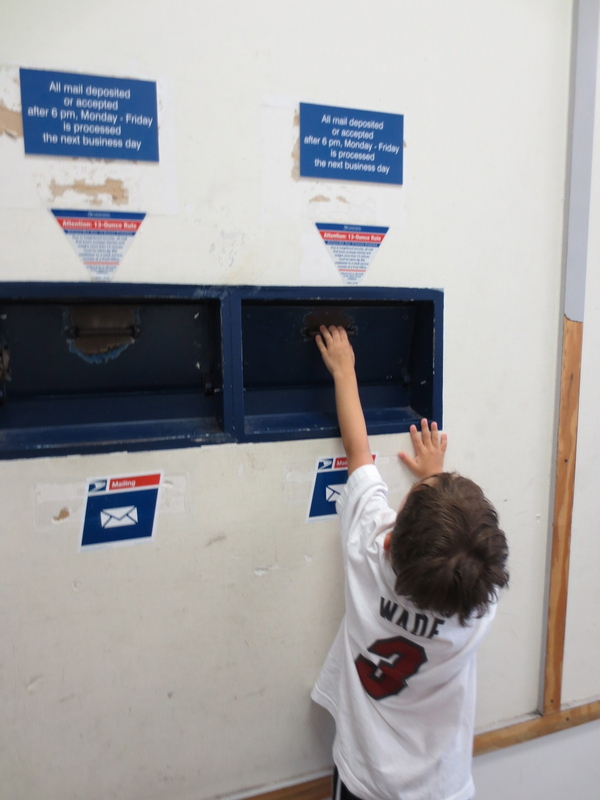 There’s also nothing more heartbreaking than a kid on the cusp of independence who doesn’t know how to mail a letter. Bravo Dylan! And bravo Runaway Mama!